Paddleboarding with your dog is a great way to spend an afternoon outdoors, and with the right approach, you can properly introduce your pup to your SUP and be on the water in no time at all. While paddling with your pooch isn’t a difficult activity to learn, there are some important things to keep in mind when it comes to safety and overall enjoyment. In this article, we’ll discuss 7 great SUP pup tips that will help you skip some of the frustration and safety mistakes that many make. Our easy-to-follow list will take you from newbie to pro pooch paddler, and we know that you’ll end up having a safer, more enjoyable time on the water with your four-legged friend as a result of these simple tips. When you’re just starting out, the last thing that you want to do is immediately throw your pooch on your board and paddle out. Your dog has not had time to get comfortable with the idea of standing on your board, and it’s important that the two of them are properly introduced. With the fins on your Thurso Surf board removed, lay the board flat on the ground and let your dog check things out. Allow them time to sniff the board and become comfortable around it. After some time has passed, lay a few treats on the board and encourage them to get up on the board’s deck and move around at home or in your yard. Repeat the process of letting your dog get comfortable when you get to your paddle site. It’s really important that your dog makes a positive connection with your board from the very beginning, and taking the time to do that will ensure that the transition to water is a smooth one. Lindsey practicing the doggie basics at home with her paddle pooch before setting out on their maiden voyage. While this may sound silly to some, a doggie PFD is an extremely important SUP accessory to pick up if you’re planning to bring your dog along for a paddle. Even if your dog is a strong swimmer with a seemingly endless amount of energy, a dog life vest will provide added insurance against accidents and allow you to stay focused. A second benefit provided by dog PFDs is that they make it far easier to handle your dog while on the water. 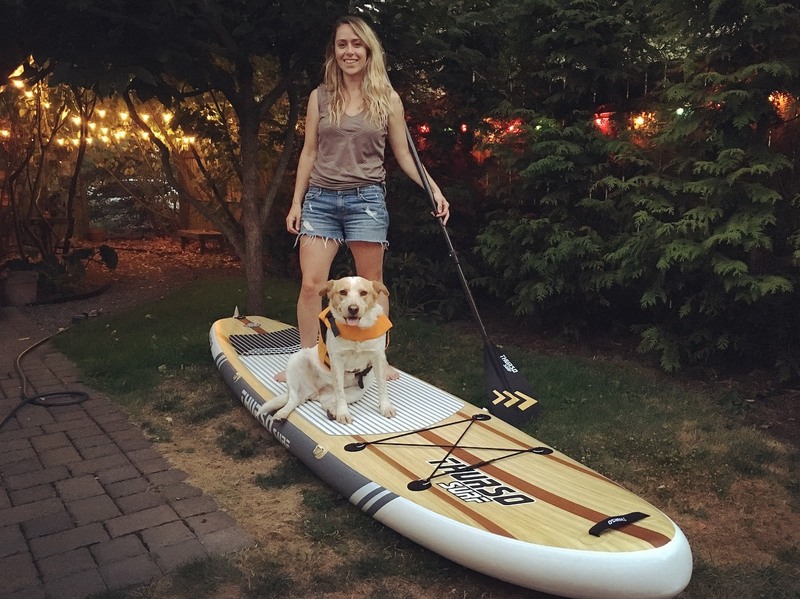 Dog life jackets typically feature a handy grab handle along the top, giving you a convenient way to help your SUP pup onto and off of your board. Last but not least, a doggie life vest can improve low-light visibility which is important if you’re out in the water during the evening hours. Most doggie PFDs feature high-visibility, reflective trim which will help boaters and other paddlers to spot your dog if they’re swimming in poorly lit conditions. Just like you did with your board, allow time for your dog time to get comfortable with their new life jacket before taking them out paddling with it. Letting them wear it around the house for a bit will properly acclimate. When you arrive at your paddle site get them in the water and let them feel what it’s like to swim with a life vest on. They’ll feel more comfortable and it will also give you a good opportunity to dial in the perfect fit. The life jacket should provide a secure yet comfortable fit, so if it twists too easily or constricts your pup’s movement, you’ll definitely want to make some adjustments. Raleigh modeling a pupper PFD with handles. If you’re a longtime dog owner and new to the world of pup paddleboarding, it may sound strange to read a warning about leash usage. While dog leashes are normally a staple safety accessory for dog owners, using one while you’re out for a paddle can actually be a dangerous thing for both you and your pup. While out on the water, you and your dog share a limited amount of space on the deck of your SUP. Dog leashes can easily become tangled, quickly transforming them from a safety accessory into a safety hazard. Location and paddling conditions are two factors which will have a dramatic impact on your SUP experience. Whenever paddling out with your pooch, it’s best to choose an area that offers calm conditions. Avoid rough waters, strong currents, high winds, and excessive boat traffic. Another important consideration is the surface of the bottom underneath the water. Does your paddle location have a rocky ocean or river floor, or a soft, sandy bed? Rocky, sharp surfaces can do a lot of damage to your pup’s paws, so it’s best to pick a spot that has soft or sandy surfaces. Sean and his paddle fam on placid waters in Gongliao District, Taiwan. Chances are, once you get out on the water with your pup and begin exploring together, you’ll want to stay out all day long. There’s so much to experience when paddling, and having your pooch along for the adventure will make it that much more enjoyable. Despite the fact that you’re having a blast together, resist the temptation to stay on the water for lengthy periods of time as this can lead to exhaustion and excess sun exposure. While out on the water, your pup is going to be exposed to the scorching hot sun and won’t have easy access to drinking water as they do at home. Before leaving home, be sure to pack plenty of water and dog treats for your pooch in your Deck Bag. This’ll keep your pup comfortable and content for the duration of your SUP adventure. After you’re done paddling, be sure to bathe your dog or at least give them a good, thorough rinse. This is especially important if you’ve been in salty or brackish water. Sand and salt water exposure can dry out their skin and coat and lead to itchy discomfort. Quickly bathing your pup after a paddle will avoid these problems and leave them smelling better to boot. We hope that you enjoyed these tips about how to paddle board with your dog. While it takes a little bit of time to properly prepare your pup for their paddling adventures, we can assure you that the small time investment required will pay big dividends once you get to the water. Following the important tips in this article will not only result in a safer experience on the water for both you and your dog — it will also ensure that you have the maximum amount of fun together. Leica and Dublin, the four-legged firstmates of Our Overland Life, in their PFDs, ready to hit the water!